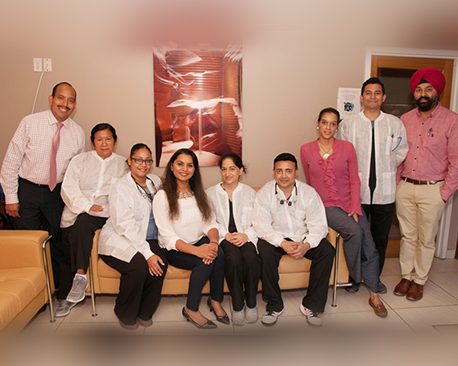 At North Island Dental Arts in New Hyde Park, we are committed to providing the best and most effective dental care for each patient. Conveniently located a short drive from North Shore/Long Island Jewish Hospital, we offer extended hours on Saturdays and multiple dentists to best meet every patient’s needs in a timely fashion. Our team is dedicated to keeping patients informed of all available treatment options so you can make an educated choice and feel good about your results in an affordable manner. In certain scenarios, the advanced dental care is needed to improve patient’s oral and overall health. At North Island Dental Arts, our in-office periodontist helps create treatment plans that address the progression of gum disease while preventing further damage. For patients looking for advanced tooth replacement options with dental implants, our New Hyde Park periodontist is able to ensure you receive a permanent restoration that contributes to the long term health of your smile. North Island Dental Arts are excited to offer patients the best gum care in New Hyde Park. Our New Hyde Park dentist is committed to providing patients with long-lasting, beautiful smiles. For patients missing one or more teeth, North Island Dental Arts offers comprehensive dental implant and implant-based solutions in office. Working with a state-of-the art local lab, Dr. Dhar provides patients with a high quality restoration that lasts a lifetime. Visit Our New Hyde Park, NY Dentist Today! When you visit our office, you will be greeted by a friendly staff and given a tour of the office. We will address any concerns you might have, answer questions, and then give you a comprehensive exam in order to determine your overall dental health. For more information or to schedule an appointment, contact our office in New Hyde Park today. If you're vising North Island Dental Arts for the first time, be sure to visit our New Patient Center for registration forms, insurance and financing information, and promotions! Make an appointment today...... we'll be sure to give you a reason to show off your smile!